Welcome to my page. It ain't much, but it's home. This site is where I have a chance to play around with web stuff. For instance, if you're using Mozilla, the above image is a PNG. If you are using anything else, the above image is a GIF file. Why? Because, for now, Mozilla (and derivatives) is the only browser that seems to render it correctly. There may be others, but I just don't feel like enumerating all of them into the page code. It just ain't that important to be worth the hassle. 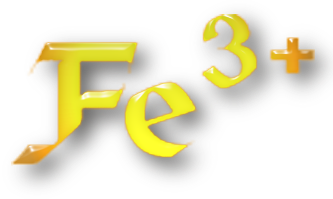 I guess you may be wondering, "why Fe3+?" Notice that the URL you've come to is "~ferric". It's also the first half of the chemical name for iron (III) oxide (a.k.a. ferric oxide) - refered to in some circles as rust. I know, "so what the hell does that have to do with anything??" For starters, it's my userid. Don't ask why I chose it, it's been more than a decade since I started to use it, so my recollection is a bit hazy. Maybe it's because my hair, especially my beard, is a rusty brown color? The above car is my new baby. You may be able to read the license plate: it reads, "Grimace". For those of you who do not know who "Grimace" is, I commend you for avoiding McDonalds very extensive advertising efforts of, at least, the last 30 years. 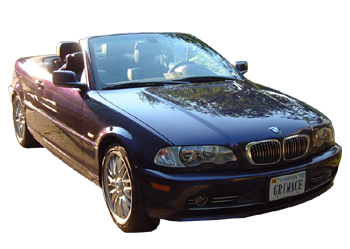 She is a 2002 BMW 330Ci convertible with custom paint job. She is actually a replacement vehicle for a nearly identical 2001 model. The 2001 had been stolen from in front of my previous home. Yep. Seven days, to the day, after the events that transpired on 9/11, I came out to go to work only to find my car gone. The car that I had waited 5½ months to be delivered and got to own her for precisely six months (almost to the day). Fortunately, the replacement only took 3½ months to arrive. Biggest difference between the two: 19" wheels instead of 18" wheels. Any way, I have other pictures of her on another page, along with pictures of my Z3. Now, no personal web page would be complete without links to things like resumes, personal writings that no sane person would really care about, etc. Well, with the exception of my resume, all my writings, etc. are quite old (written in the latter third of the 1990's). I will have to look at them to see if I want to even include links to them - I am not the same person that wrote those pages, so who knows if they're relevant enough to include? At any rate, if you have use for a Unix weenie, please feel free to check out my resume. In spring of 1999, I adopted a pair of Bengals - a still somewhat uncommon breed of cats - named Grumbles and Bella. They looked like little leopards. We lost them to chronic kidney failure in spring of 2016. Bella's were completely kaput when we had them put down and the lab tests said that Grumbles's would be similar inside the next 6-9 months. Because they came into the world together and spent their lives together, it seemed best to send them onwards, together. Our first summer in our current house, we adopted a Boxer/American Bulldog mix, Lana. She was very much my wife's mutt - frequently howling whenever Donna would leave the house to run errands. We lost her to cancer in December 2010. The following summer, we aopted Puckett. While he loved everyone, he was very much my dog. He was a Bull Terrier/American Bulldog mix. Wasn't the most handsome specimen of dog, but his goofy personality more than made up for any aesthetic shortcomings he had. We lost him to cancer in April of 2011. After losing Lana, the same rescue that had placed her with us placed another wonderful brown dog with us. Her name was Cira. She was a very stoic little brick of a staffordshir terrier. We lost her to kidney failure almost exactly a year after losing the cats to the same cause. Much as Cira was an attempt to fill some of the hole left in our lives by Lana's passing, we got Lady to try to fill the gaping hole left by Puckett. Where Puckett was goofy in temper and appearance, Lady is pretty in appearance and sweet and cuddly. During the overlap in their time, the cats were always around her - probably because she is so warm. With Cira's passing, we were lucky enough to have a third dog placed with us by the same rescue who gave us Lana and Cira. Her name is Kaiya. When we got her, she had a long tail that she loved to wag. Sadly, she wagged it so much and so hard that she kept hurting herself. We tried to get her through river season - because she loves playing in the river. Sadly, it got infected and we had to have it surgically-docked. She wags what she has left quite vigorously ...and we now call her "Nubz" as much as we ever call her by the name she came with. She and Lady seem to be boon companions. On October 25th, 2003 Donna and I had our public wedding ceremony. We had been legally married the immediately previous January by a JoP in Philadelphia, but couldn't afford to have a formal ceremony. So, we delayed that till October. It was an Elizabethan/Scottish themed wedding. The wedding party and a number of guests were attired in Elizabethan nobles and/or formal Scottish attire. Was told by all who attended that it was one of the nicest weddings they'd been to.